Promo Trailer Mark Van Tine artist Profile video. Promo Trailer Mark Van Tine artist Profile video. Tips & Tricks! Rusty Nail, Priming used as a guide Resin Maniacs Tips & Tricks with Rusty Nail. Priming used as a guide by Rusty Nail. 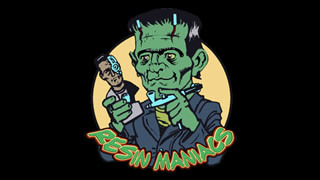 Resin Maniacs was founded in 2005 in Germany. The idea was to build a global community that brings people closer together who share the same love and passion for the scale figure model kit hobby. The scale figure model kit hobby has wide variety of different branches, like small scale figure modelers/miniature figure modelers, large scale figure modelers commonly known as garage kit builders/modelers. There are also different materials used to produce figure model kits. Like Resin, styrene, vinyl and metal. Our vision is to bring together all scale figure modelers no matter what scale or material of figure model kits he or she likes to build and paint. Copyright 2005-2019 © Resin Maniacs. All rights reserved.